Intel Core i9-9900K, Core i7-9700K and Core i5-9600K Specs Revealed – Coming Soon! Aside from the GTX 11 series release dates being leaked, another interesting information surfaced online. This time, specifications of the upcoming 9th Generation Intel Core i9-9900K, Core i7-9700K and Core i5-9600K surfaced. These 9th gen processors offer faster clock speeds compared to their 8000 series predecessors, and on top of that they offer more cores as well. Obviously, this move is to combat AMD’s Ryzen 7 2700X that has been performing very well, especially in multi-threaded workloads. The 9th gen CPUs are based on the 14nm++ Whiskey Lake silicon, and are designed for the upcoming Intel Z390 motherboards. Although, these new CPUs may also work with the current Z370 motherboards via BIOS update. More details below. Disclaimer: Intel hasn’t officially released the 9th generation Core i9, i7 and i5 CPUs (yet); neither the Z390 motherboards. All information here are based on the “leaked” information from Coolaler via Computerbase. You may want to take some information here with a grain of salt. Although, we know that Intel will be releasing these soon based on previous reports and announcements. Previously, there were some reports that Intel will be releasing 9000 series CPUs; but the previous reports only talked about Core i5 and Core i3 non-K (locked) SKUs. Recently, leaked details regarding the Intel Core i9-9900K, Core i7-9700K and Core i5-9600K finally surfaced. We don’t know yet if Intel will replace the 8th gen Core processors when these new 9th gen are released (I doubt that). But there are reports claiming that it’s end for the Z370 motherboard, as they will be replaced with the newer Z390 motherboards. The table below shows the specifications of the upcoming 9th generation Intel Core processors (based on the leaked information); together with the current 8th gen unlocked core processors for comparison. Intel Core i9-9900K 8 Cores 16 Threads Up to 5GHz – Ryzen 7 2700X Killer? The Intel Core i9-9900K will be the flagship of the upcoming 9th gen Core processors. It features 8 cores and 16 threads, boasting clock speeds of up to 5GHz (max turbo). A little explanation on the max turbo if you’re not aware of it yet. The CPU will crank up to 5GHz, but only for a single core. Then up to 4.8GHz with 4 cores and finally up to 4.7GHz with 6 to 8 cores. But I’m guessing that you can manually overclock the CPU to run 5GHz (or more) on all cores. With those clock speeds, the Core i9-9900K looks like an AMD Ryzen 7 2700X killer. The Ryzen 7 2700X has 8 cores and 12 threads, but can only clock up to 4.3GHz. This is where the Ryzen 7 2700X would lose against the i9-9900K. I’m guessing that when the i9-9900K will finally be released in the market, AMD will adjust the current pricing of their CPUs; and/or AMD will release the rumored Ryzen 7 2800X to combat the i9-9900K. Second is the Core i7-9700K processor that can clock up to 4.9GHz on single core, or 4.6GHz on all cores. I’m not really sure if I’d be happy with this CPU; it has 8 cores but only 8 threads. Its predecessor, the i7-8700K and the i7-8086K Limited Edition has only 6 cores, but with 12 threads. Both the i7-8086K and i7-8700K processors are capable of reaching up to 5GHz on all cores via manual overclocking. 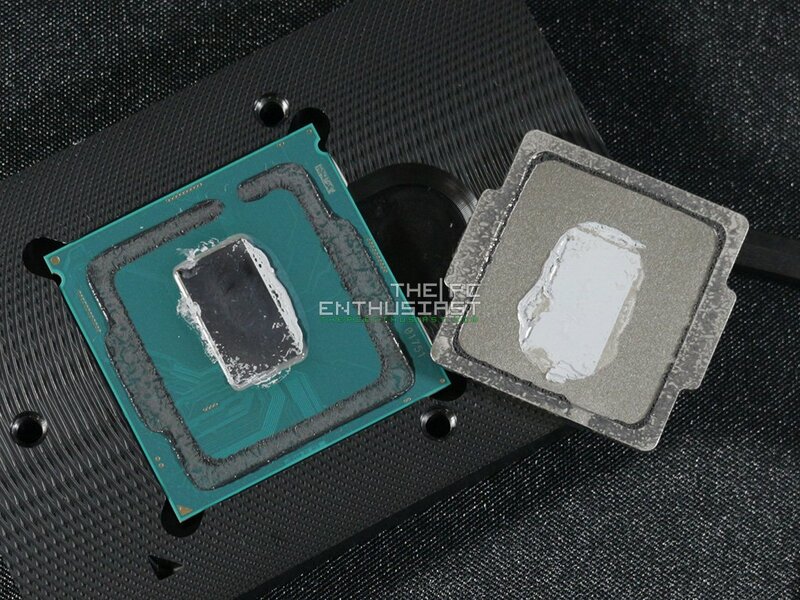 Well, you probably need to delid the i7-8700K and use a very good water cooling solution to maintain the temperature and prevent thermal throttling. Nevertheless, despite having only 8 threads, it does have 2 more physical cores compared to its predecessors. And I’m guessing that overclocking this CPU will be (a bit) easier compared to the previous 8th gen i7 as well. Finally, the Intel Core i5-9600K featuring 6 cores and 6 threads. Core and thread count are the same with the current 8th gen Core i5-8600K But it will have a higher clock speed of 3.7GHz base and up to 4.6GHz max turbo on a single core, or 4.3GHz on all cores. The Core i5 series has always been the gamers’ choice, due to its more affordable price tag and bang for buck performance. I just hope that the new i5-9600K can also be overclocked up to 5GHz. The 9th gen Intel Core processors are said to be released towards the end of Q3 2018, more or less. NVIDIA GeForce GTX 1180, 1170, 1160 including 1180+ Release Dates Confirmed?? ?